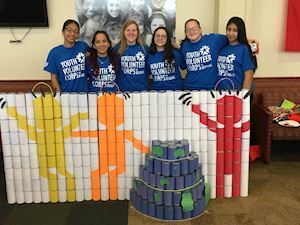 As a Youth Volunteer Corps affiliate organization, VOiCEup Berks is dedicated to providing meaningful volunteer opportunities for youth that address community needs and inspire youth for a lifetime commitment to service. To register for volunteer opportunities, the youth volunteer or their parent/guardian must have an account (volunteer profile) on our website. Youth must be at least 13 years of age to create a volunteer profile. For youth younger than 13, please see directions for Family Team Sign-up below. All individuals under the age of 18 must have a signed parental consent form on file prior to being involved in any volunteer activities. To sign-up youth/teens for volunteer opportunities, we have found that it is easiest for the parent to create an account for themselves and then create a "family team" with the names of their children and spouses. The person designated as “team captain” will be the point person for receiving emails regarding volunteer opportunities for anyone on their team. Older teens, if they so choose, can also make member profiles on the website themselves using their own email addresses and receive correspondences directly. (Having a parent sign-up their child/teen for a team will not conflict in anyway with a teen having their own individual profile). Directions to sign-up youth on family teams. Download Youth Profile and Parental Waiver here. Contact info@voiceupberks.org for more information.